Trebor Scholz points out the launch of Tweet Congress, which represents a possible improvement on the online petition process that now has become so ubiquitous that legislators rarely respond with meaningful initiatives. Furthermore, the one-way character of such petitions from constituents to lawmakers discourages any meaningful dialogue between legislators and citizens and promulgates a culture of political reaction that growing legions of online affinity groups have only intensified. We built this site to scratch our own itch. 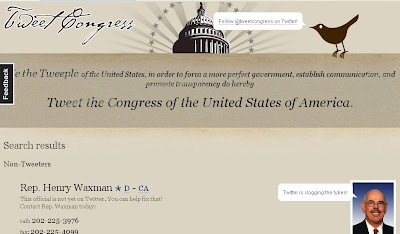 While searching for our local congressmen on Twitter we were amazed at how many folks on the Hill aren't tweeting. This site is a grass-roots effort to get our men and women in Congress to open up and have a real conversation with us. A search engine on the site allows voters to find their representative on Twitter, so they can follow their tweets and perhaps pressure non-tweeters to be more vocal in their microblogging. If your elected representative isn't on Twitter, as in the case of Henry Waxman, my own congressman, you can petition your lawmaker to join Twitter and post updates. However, even after using the microblogging service for a month, I'm still not quite sure how it could effect political change, although friends in both activist and bureaucratic cadres have assured me that it could play a role in high-stakes diplomatic negotiations and other kinds of political horse-trading.